Joey is really overweight but his sister Julie tries not to lord it over him (well, maybe just a little)! 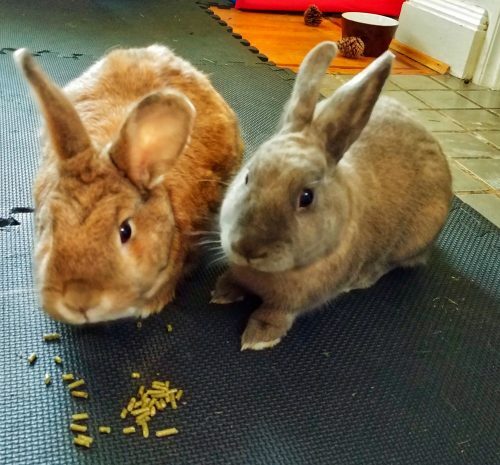 Bunnies require lots of fresh hay and veggies but limited bunny kibble and treats. 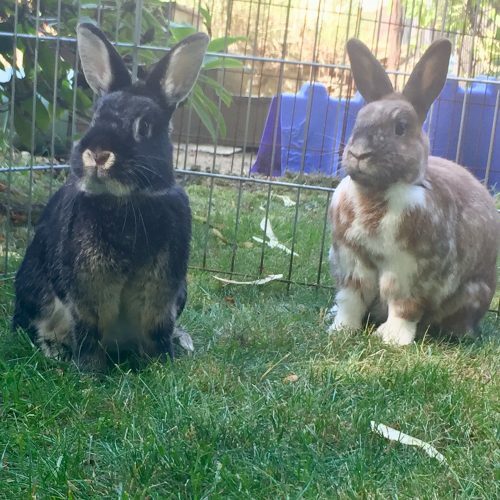 They also need lots of opportunity to hop about and get exercise. This photo shows J&J in their shelter cage but they have just come in from an afternoon outside, and so with a proper diet and more activity, Joe will start slimming down. 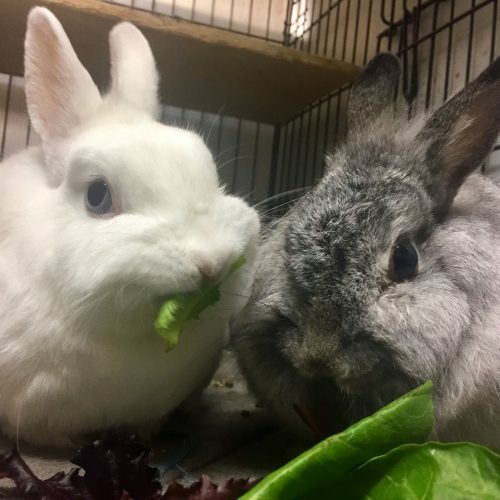 This lovely angora-dwarf brother-sister duo are sweet little souls looking forward to living cage-free, healthy, active house rabbit lives together in someone’s home soon. 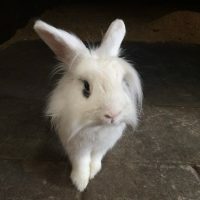 This handsome lionhead is a cheeky, social bunny who seeks a quiet, calm home (adult human companions only, please – not children). 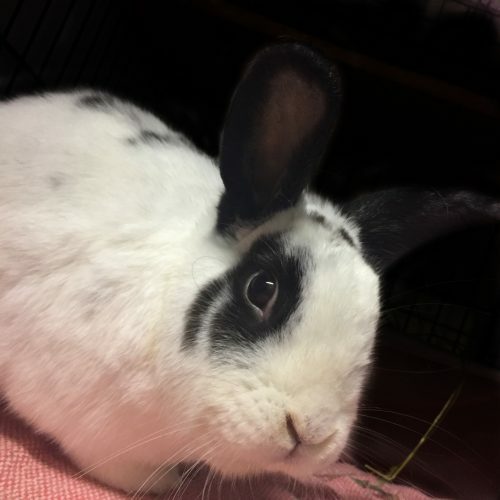 Rabbit-friendly cats and dogs could be fine, and he might even enjoy a rabbit companion or two, given proper introductions. Spartan seemed “aggressive” in his first adoptive family but he was reacting out of fear. Since then he has been in a foster home, where he has been socialized and exposed to lots of new things; he is much more confident now. Spartan enjoys living free-range and receiving leisurely head pats (he purrs). He might be a good agility candidate, as he vaults 3 feet into the garden when he gets to play there (with his human supervising to make sure he is safe, of course). Spartan needs a home where someone with patience will help him continue to build confidence. Logan was born February 16, 2018. He’s curious, active, and good with his litter box. He was raised in a home with a quiet, kind child. This handsome fellow is looking for a trusting home where he can become part of the family. 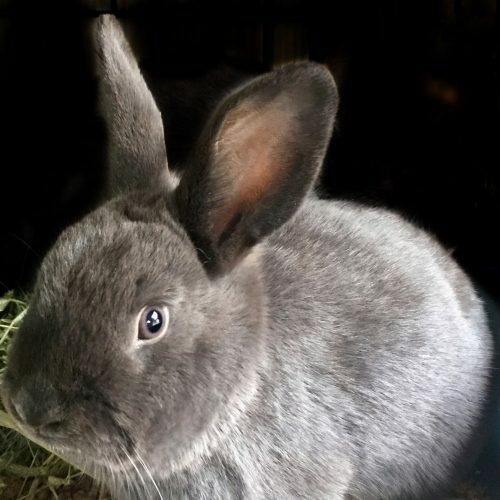 Flora is a beautiful New Zealand Flemish cross bunny with GORGEOUS blue eyes and lovely tall ears. She came to us after being found running loose in the Abbotsford-Mission area. Since then she has spent time in one of our foster homes and they report that she’s a friendly girl. We suspect that she may not hear well, although that doesn’t affect her sweet personality. Flora uses her litter box well. She likes to dig and so needs a big litter box where she can keep busy tossing her hay around. She will be happy to have a home to explore. These beautiful sisters came from Jericho Park when a few days old. Their nest was dug up by the Parks crew, who saved them and turned them over to VRRA. They have been hand raised on love and formula and are the sweetest girls. Wren has a little white mark on her nose. Sparrow is very slightly bigger. They are out-going, curious bunnies that are good with their litter box and not destructive. Sparrow and Wren will be wonderful, house companions. Special rabbits for special people. These sibling (one sister and 3 brothers) lost their front feet to a predator when they were small babies. The most likely scenario is that they were kept on wire and that something bit their little feet off from below. Alfie, Alma, Alan and Amos do not know that they are different. They love each other as the photo shows. Alfie and Amos get around so you wouldn’t notice they were different. Alan and Alma have slightly more trouble as they lost a little more leg. 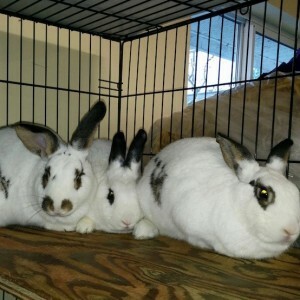 But they all behave as normal rabbits and are doing very well. 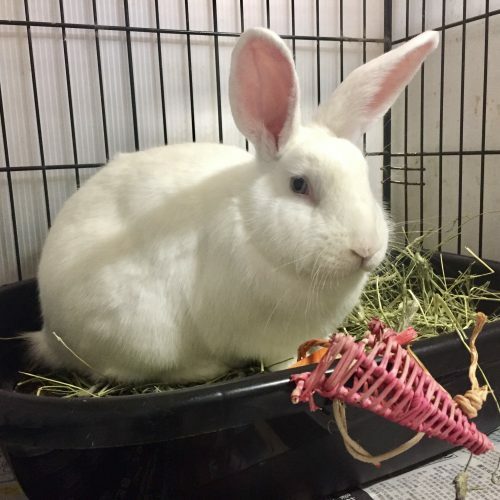 It is, of course, important that they are kept on surfaces that will not hurt their legs but this is not a difficult thing to do and they use their litter boxes well. All are in good health and are good hay eaters. It would be wonderful if they could find a loving foster home together. Everything could be provided. Only love needs to be added. 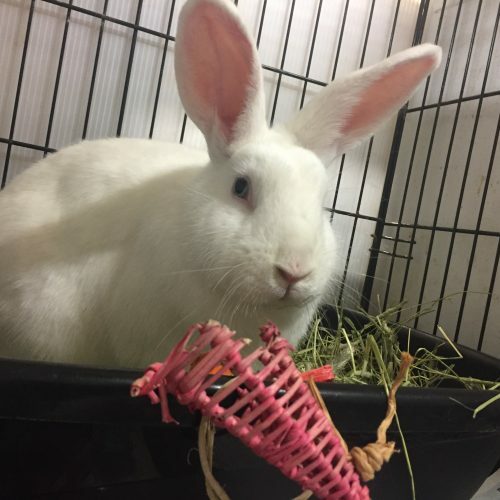 Rupert is a bit shy at first but a calm, kind bunny with a nice attitude. He was picked up in Jericho Park where he would have been coyote food. Rupert is litter trained and not a chewy rabbit. 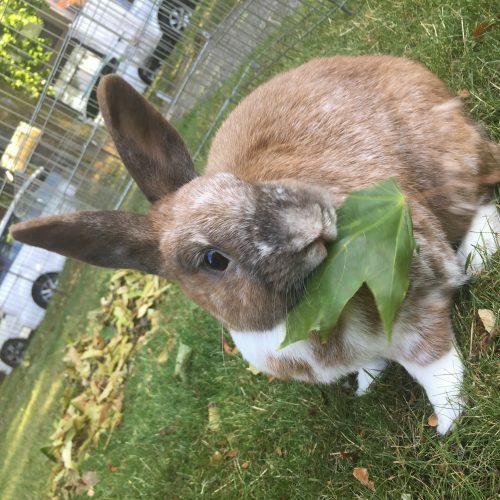 He would probably enjoy the company of other rabbits. 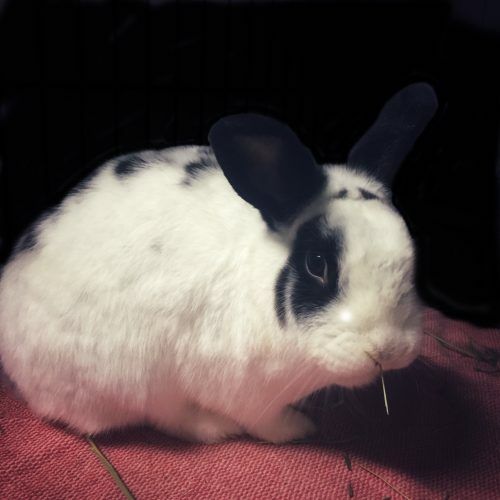 He is a young adult and will be happy in a home where he can run and play, and become a member of the family. Check out our video of the sweet guy. These beautiful, big, black and white girls were rescued from a neglectful situation when they were about 3 months old. 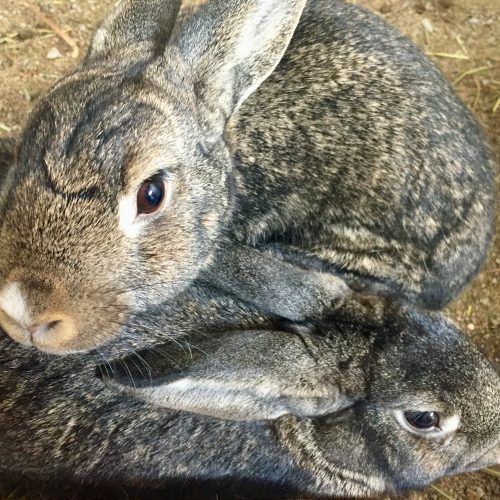 They have grown into very lovely rabbits. Venus is the mom and Juno and Diana are her daughters. They make a delightful trio. 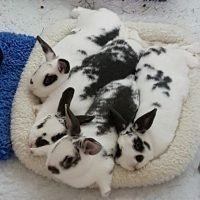 It’s even better to have three rabbits than to have two rabbits. They provide endless entertainment with their interactions. They would like a home with room to run about, some treats and people to love them. They are just over a year old. 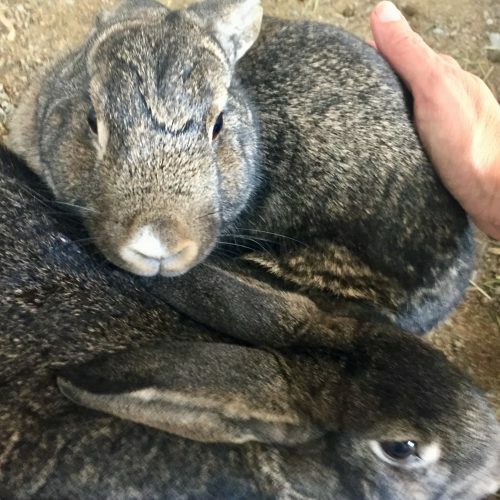 These poor bunnies were up for grabs at a garage sale. Lucky for them friends of VRRA picked them up. Benji is a tan and white boy, quite likely a Rex cross. 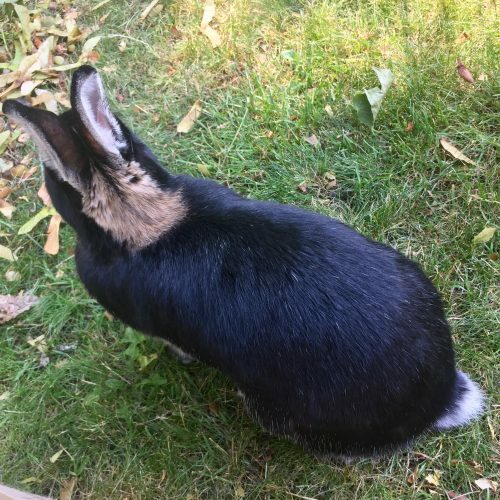 Jade is a very pretty black Martin rabbit. They are good with their litter box and not chewy except for their cardboard box. Benji is a bit overweight and sometimes a little crabby. He needs more room to run about. Jade is a little sweetie and shy until you know her. Benji is 3 or 4 and Jade is younger.